1) Hans Hermann Hoppe can see the invisible hand. 2) There is only one risk that is random yet still un-insurable: The risk of Hans Hermann Hoppe. 3) Hans Herman Hoppe can homestead intangible concepts and ideas. 4) Hans Herman Hoppe possess the worlds only free market monopoly. on fear. 5) Ron Paul tells people to google Hans Hermann Hoppe. 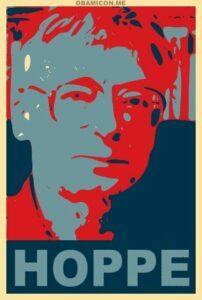 6) Hans Hermann Hoppe’s icy stare can breach the non-aggression principle. 7) Hans Hermann Hoppe wasn’t born. His existence is an a priori statement. 8) It turns out Ayn Rand actually wasn’t an atheist. She was a mystic who worshiped Hans Hermann Hoppe. 9) The score for Jaws originally had lyrics, but Speilberg removed them due to an entire screening audience dying from shock. The lyrics consisted of 3 words: “so to speak”. 10) When God made the world, he originally intended air to be a scarce resource, until Hans Hermann Hoppe told him otherwise. 11) Friedrich Nietzsche isn’t a philosopher, but merely a witness to the above altercation between God and Hans Herman Hoppe. 12) Hans Hermann Hoppe has 2 speeds: walk, and logically deduce. 15) Hans Hermann Hoppe’s e-mail password is the entire memorized text of Human Action. 16) When Hans Hermann Hoppe and his wife got married, they didn’t exchange wedding vows… they administered Mundliche Prufung’s to each other. 18) Hans Hermann Hoppe doesn’t need to trade essential liberty for temporary security. He trades steely glares for absolute security. 19) The 3/5 clause was not originally meant to count slaves as 3/5 of a person. It was meant to count regular people as 3/5 of Hans Hermann Hoppe. 20) The Supreme Court has ruled that it’s not protected speech to shout “Hans Hermann Hoppe” anywhere, public or private. It always results in unsafe stampedes of adoring Austrians Economists. 21) Hans Hermann Hoppe co-wrote a paper once. The co-author: Hans Hermann Hoppe. 23) Due to recent competition, the webmaster at www.chucknorrisfacts.comwill soon have to realize his value to society in a free market – working the mechanics of a gas pump. Hans Hermann Hoppe is the only professor who would not be attending the mechanics of a gas pump in an anarcho-capitalist world. Hans-Hermann Hoppe thinks in paragraphs. Hans Hermann Hoppe and his wife didn’t “decide” to “have a baby”… they “logically deduced” that a “lowered time preference” was consistent with their “subjective value functions”. That roaring sound you hear when listening to Hans Hoppe speak for the first time is the implosion of your thoughts that minarchy might work. Economic Calculation in the Socialist Commonwealth is impossible… unless Hoppe is doin’ the calculating. Hans-Hermann Hoppe owns the idea of Stephan Kinsella. Chuck Norris became a libertarian, his name is Hans Hoppe. The standing-room that Hans Hoppe inhabits is not scarce. 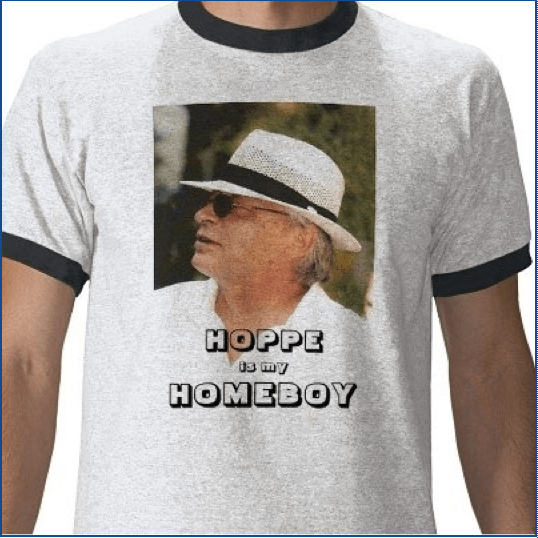 Hoppe was never a Misesian, Mises was a Hoppe-ian. The existence of Hans Hoppe transcends the is/ought dichotomy. Democracy failed because there can only be one true god: Hans Hoppe. Whenever Hans Hoppe makes a voluntary exchange, only he is better-off. When Hoppe came to the United States, Germany went into a recession. Next post: The State is the Problem. Anarcho-Capitalism is the Answer.